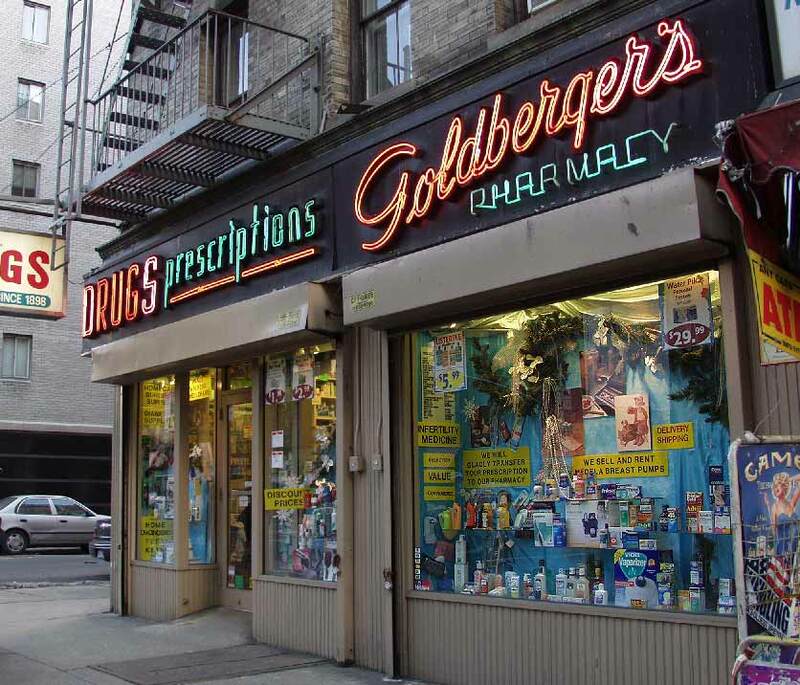 Goldberger's Pharmacy was founded by Aaron Goldberger, an immigrant from Hungary, around 1908. He was listed in directories as a druggist as early as 1900, and had his own drug store at 782 Second Avenue (near 42nd St.) in 1908. In 1915 Goldberger's Pharmacy was listed at both 782 Second Ave. and 1200 First Ave. Beginning in 1917 Leo Bigotti was listed as the proprietor of the store at 782 Second Ave. Apparently by that date Aaron Goldberger sold the store on Second Ave. to Bigotti and had his own store at 1200 First Ave. After 1920, listings include only 1200 First Ave. as A. Goldberger's Pharmacy. According to the 1900 U. S. Census, Aaron Goldberger (1861-1927) was born 15 June 1861 and immigrated to the U. S. in 1885. The 1925 New York State Census recorded him, age 61, born Hungary, living at 985 Fox St., the Bronx. Although his occupation is given as druggist, he may have been retired by this time. The 1922-23 Polk New York City Directory listed his son, Abraham Goldberger, as proprietor of A. Goldberger's Pharmacy, 1200 1st Ave.
A. Goldberger's was continued through a second generation by two sons, Abraham Goldberger and Sidney Goldberger, both born in New York City. Abraham Goldberger (1895-1965) was born 4 May 1895 and registered for the World War I draft in 1917 when he was 22 years old and employed at A. Goldberger, 1200 First Ave. His registration specified that he had faulty eyesight. Abraham also registered for the draft in 1942 when he was 46 years old and lived at 425 East 72nd St., Manhattan. Sidney Goldberger (1897-1973) was 21 years old when he registered for the World War I draft in 1918. He was born 1 June 1897 in New York City, and he was employed at Aron Goldberger, 1200 1st Ave. (Aaron Goldberger often spelled his first name with only one A). As of August 2014 Goldberger's is still in business at the corner of 1st Ave. and 65th St. Their website says, "Established in 1898, Goldberger's Pharmacy has been in business for over one hundred years, providing our patients and customers with an excellent quality of pharmacy care, services and products. All while maintaining your confidentiality." Several sources incorrectly state that the pharmacy has been in its present location since 1898. This one, for instance, from the AIA Guide to New York City, by Norval White & Elliott Willensky with Frank Leadon, 5th edition, 2010, "Anchoring the ground-floor corner of East 65th and First Avenue, is Goldberger's Pharmacy, a rare find indeed: a drugstore from 1898 still in its original location. Check out the hard-to-miss neon sign. The old New York, still dispensing." Thomas E. Rinaldi, in New York Neon, 2013, dates the Goldberger's neon sign ca. 1960, "Goldberger's Pharmacy / 1200 First Avenue, c. 1960. Goldberger's Pharmacy traces its origins to 1898. Its neon fascia sign stands out as something of an antique in the twenty-first century, but it must have struck some as a bold new look for an establishment that had already been in business more than fifty years before the sign appeared." The buildings at 1194 to 1200 First Ave. between 64th and 65th Sts. and First Ave. to York Ave. were constructed by the City and Suburban Homes Company as experimental housing for the working class in 1898. Possibly it has been this date that has misled researchers to place Goldberger's Pharmacy here twenty years before their time. There was, however, an earlier pharmacy here according to this notice in The Pharmaceutical Era (Weekly), volume XXXVII, January-June 1907, "New York City. - Louis Lasser, 1200 First avenue, has been succeeded by Bronstein's Pharmacy." There is no evidence that Aaron Goldberger was associated with either Louis Lasser or Bronstein's.